Students naturally respond to Frans' warmth and intelligence. His own personal spiritual Reiki practise is a model that many students wish to emulate and offers great encouragement to those on the same path. Frans is a co-founder of the International House of Reiki and Shibumi International Reiki Association with his wife, Bronwen Stiene. He has also co-authored with her the critically acclaimed books The Reiki Sourcebook, The Japanese Art of Reiki, A-Z of Reiki Pocketbook, Reiki Techniques Card Deck and Your Reiki Treatment. Originally from Holland, Frans is now based in Australia and since 1998 has trained in a variety of countries such as Japan, Nepal, Italy, UK and Australia. His teachers include Hyakuten Inamoto, Doi Hiroshi and Chris Marsh. Frans' research has included interviewing Yamaguchi Chiyoko (now deceased) and other Japanese teachers including Dr Matsuoka. Frans is currently training with a Japanese Shingon priest, Takeda Hakusai Ajari (see photo left), who was once a Tendai monk as a disciple of the great Sakai Dai Ajari, learning about Shinto, Shugendo, Tendai and Shingon. Although Frans is trained as a Gendai Reiki Ho Shihan (teacher) and a Komyo Reiki Shihan (teacher) he prefers to teach a traditional form of Japanese Reiki that he feels reflects a desire to bring the teachings back to their very source, Usui Reiki Ryoho (Usui Spiritual Energy Healing Method). The contents of what Frans teaches is formed by what has been practised in Japan since the early 1900s, long before the system of Reiki left Japan, and the researched influences on the system (see the five elements of the system of Reiki for more information). This particular method includes physical and energy enhancing exercises to help practitioners delve deeper into their Reiki practice. The earlier teachings consider the system not just to be a hands-on-healing practice but one that also focuses on a student’s spiritual path. Frans and Bronwen's open, informal style of teaching has been an inspiration for students and clients throughout the USA, Europe, Asia and Australia. Their aim is to provide students with the most comprehensive and up to date information about the system of Reiki as well as a strong energetic connection to Reiki's founder, Usui Mikao. Frans is a senior teacher (sometimes known as Reiki Master) for the International House of Reiki. Apart from teaching all three levels of the system of Reiki and specialised classes, he offers limited one-on-one training sessions for students and one hour Reiki treatments in both Australia and on his teaching tours. 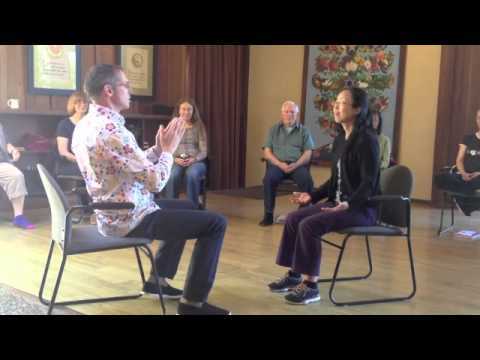 Here is a demo with Frans Stiene performing a hands on healing session.